Lead Battery Recycling Ace Pays For Car / Truck Batteries! - Ace Steel & Recycling Inc. The average car or truck battery contains twenty pounds of lead, which can be recycled over and over. In the U.S., lead has the highest recycling rate of any material; an impressive 98%! Fifty percent of our lead supply currently comes from recycled car batteries. Over fourteen million are recycled each year here; lined up end to end, that would be a string of batteries some 1500 miles long! That’s great news, as the high recycling rate keeps those batteries and their dangerous ingredients out of landfills and our water supply. Batteries collected for recycling are shipped to processing centers, where they are broken down to remove combustible material such as plastic and insulation, which isolates the valuable metal, which is then chopped into small pieces and heated until it liquefies. Non-metallic substances are burned off, and various alloys settle according to weight and are skimmed off like cream from raw milk while in liquid form. The molten lead is then poured into molds which are then cooled and shipped to manufacturers. Another environmental benefit to lead recycling is that recycled lead provides an impressive 75% energy savings when compared to producing lead from extraction. Please be careful when handling auto batteries! If the sulfuric acid in the battery makes contact with your skin, wash it off immediately. It’s best to wear gloves when handling. Never burn a battery as an explosion can occur. It’s a good idea to transport your used battery in a plastic bucket or container in the event that any acid would leak from it en route. Dropping your batteries off at Ace Steel & Recycling will provide you with a little spending money, keep dangerous chemicals out of landfills, and help avoid the high energy costs associated with the extraction of virgin lead. 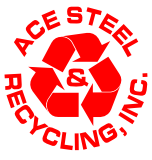 Be part of the solution, with Ace Steel & Recycling!